Tai Seng is predominantly an industrial area, and unless you work or live there, you’ll probably not know that it has a nice juxtaposition of old and new food establishments, ranging from hip cafes to traditional eateries. If you’re looking for a place for lunch, here are 10 places to visit in Tai Seng that are worth the trip. Located right next to Tai Seng Mrt, The Good Boys is well known with people working in that area for serving smoothie bowls and artisanal coffee. If that work meeting is driving you nuts and you need to de-stress yourself, head on down for their healthy bowls and super juices. The Fruity Matcha (S$12) is a vegan smoothie bowl made up of pineapples, baby spinach, banana, and Japanese Matcha. The passionfruit, strawberries and the almonds and coconut flakes gave this dish an extra texture and crunch. If you’re in for the ‘gram, the heart-shaped bowl and eccentric colours will be a hit on your feed. This halal cafe serves affordable Western fusion cuisine and it’s no wonder it is popular with the lunchtime crowd here. Though it is known for its steamboat, they serve decent western cuisine as well. If you’re planning on late lunch, head down to Flame Cafe for their 4-Tier Cheesy Hotpot & BBQ Pagoda Steamboat (only served after 3pm). The Seafood & Meat Combo (S$48.90) is great for sharing among two to three people. Maybe suggest this for your next team meeting? The seafood and warm melted cheese were surprisingly a good combination. Oh, by the way, cheese top-up is free! The queues here are long and being Singaporeans, you know it’s a sign of something good. Took La Dee which means cheap and good in Thai is authentic as it gets and the Thai food does not burn a hole in your pocket. We were excited when this famous restaurant chain in Bangkok opened up in Singapore and we knew we had to try it for ourselves. We tried the best seller which is the Pad Krapow (S$3.80) and we weren’t disappointed. What is unique about this dish is they use a basil specially imported from Thailand, aka holy basil, which adds a spicy, peppery, clove-like taste that permeated the pork. I would recommend you to add S$1.20 for a sunny-side up egg to complete the meal. The Boneless Kitchen serves up quality vegetarian dishes and they sourced their ingredients directly from Korea to give you the most authentic taste and experience. Our favourite was the Kimbap – Korean Rice Roll (S$8.90) and they were generous with the filling of mock meat, cheese, egg and vegetables. There were crunch and texture in every bite and the mock meat was not starchy and complemented well with the strong sesame oil flavour. This cosy minimalistic cafe serves inexpensive Western fusion dishes and you can complete your meal with a soft drink or cake for an additional S$4. The Green Curry Seafood Pasta (S$13.80) is made up of linguine, mussels, small prawns, clams and squid. It reminded us of laksa, given the strong aroma of coconut and the hint of kaffir lime leaves. If you’re in luck, you can get the Earl Grey cream puff (S$1.50) that is off the menu. This cream puff has a cookie-like crust at the top and it was a new experience for us. The cream inside has an intense Earl Grey flavour that goes well with hot coffee. If you’re looking for a light snack or a coffee break, this place will be a good break from work to gather up your thoughts and ideas. Just a stone’s throw away from Tai Seng Mrt, 23 Jumpin serves a wonderful brunch menu and quality coffee. If you’re tired of having the usual pizza, try their Mushroom Pizza Waffle (S$14), which is baked to golden brown and topped with a generous portion of ingredients. If you’re in the mood for some alcohol during lunch without being judged, the closest thing you could have is tiramisu which is home-made and made with kahlua. They don’t skimp on that liquor and you don’t have to worry about getting high. Voted the Best Restaurant in 2015 by HungryGoWhere, and most popular restaurant by Quandoo, the highlight of this restaurant is its fresh lobster and seafood. The Boiler’s Duo Bag (S$52) includes prawns, mussels, clams, sausages, corn & bun. You can choose from four types of sauces that their signature ‘The Works‘ that ranges from mild to ragin’ hot intensity, garlic butter, peppa’ butter and sauce of the month. If you’re a big fan of lobster, you can enjoy a whole lobster for S$55 (U.P S$75) while the promotion is ongoing. Sweet deals should be shared with friends, grab your foodie kakis and indulge in the freshest seafood, greatest music and endless booze at The Boiler. Local Chef Peter Neo serves Italian food with an Asian twist at FUZE by Blend It Up. Every food is made from scratch and fresh ingredients are used for all the dishes. Expect pizzas with local ingredients like salted eggs and Rendang chicken spaghetti. Complete the dining experience by pairing your dishes with wine. Their signature dishes include the Blend It Up Pizza (S$19) topped with baked ham, feta and mozzarella cheese. Join their pizza making classes during your free time and how to make the perfect crust to impress your friends. This list would not be complete without having this restaurant in the list. One of the pioneers of Muslim Restaurants in Tai Seng, Muslim Delights continues to be a crowd’s favourite during lunchtime. The Nasi Padang here aren’t too expensive and the dishes and special changes daily so you can expect to try something new each day. Their Mee Soto is one of my favourites to have as the bowl is filled with chicken chunks and I enjoyed putting in lots of sambal to make it extra spicy. You should come earlier to avoid the huge lunch crowd and enjoy the Nasi Padang fresh and hot. This restaurant hit the news when the recipe for their famous char siew was sold for a record-breaking four million dollars. Undoubtedly, they are one of the best restaurants that make char siew, roast duck and roast pork the old-fashioned way. The char siew is known to have no artificial colouring and are served in thick slices. If the recipe is sold for that much, you know it’s good stuff. Up to this day, the former owner, Betty Ong is still making rounds making sure the restaurants maintain consistency and high standards. Talk about dedication to your craft. From the humble beginnings of a hawker store in Chinatown food centre to gaining worldwide recognition as the only hawker stall to be awarded a Michelin star, Hawker Chan has made its way to Tai Seng. Skip the queues here as traffic has not made its way here, yet. The must-try is the store’s signature dish is the Soya Sauce Chicken Rice (S$3.80). You can expect juicy and fleshy chicken meat that will make you nod your head in approval. For a Michelin star restaurant, the price is considered affordable and the best thing is, you won’t be sweating in the heat as the place is air-conditioned. A new kid on the block, I stumbled upon JJAK & Co. by accident while walking through the carpark at the new Tai Seng Centre. You can create your own poke bowl of your choice and if you’re too lazy, you can order off their menu. If you need a quiet place for a drink with privacy they serve sake and premium beers all day long too. Topped with fresh salmon cubes and tossed with their homemade spicy sesame sauce, the Spicy Salmon (S$14.90) got me feeling satisfied and happy. Be warned, they’re not stingy with the chilli padi and if you can’t handle the heat, do tell them. I’ll be back to try more items on their menu next time. Tucked in the corner of 18 Tai Seng, The Prata cafe specialises in local Mamak stall dishes — expect prata, thosai and delicious biryani. If you enjoy people watching, grab their outdoor seat while enjoying your local delights. The Paper Thosai Set (S$4) comes with coconut chutney, fish and chicken curry. Light and buttery, this dish will fill your stomach easily without making you feel excessively bloated. This paper-thin delicacy feels like a snack that’s appropriate for any time of the day. 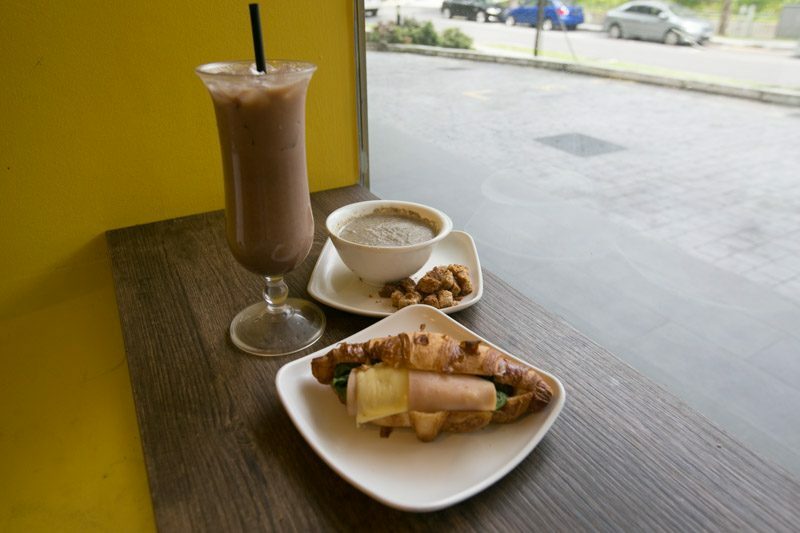 A halal cafe right in the heart of Tai Seng, Grasso Coffee has its fair share of loyal patrons that keep coming back for their lunch set. You can get good traditional coffee and they will only start brewing after you have ordered to maintain freshness and quality. I had the Ham & Cheese set (S$9.20) that comes with ice MILO and a bowl of traditional mushroom soup. This set filled my empty stomach easily. The soup is made fresh and I enjoyed the slight peppery kick to it, I wished it has some chunks of mushroom for a textural contrast. The croissant was buttery, flaky and tasted delicious with the melted cheese. When night falls, most cafes will be closed as there is minimal traffic, so it’s best to come here during lunchtime. Tai Seng is still growing in popularity with its gritty industrial charm, not to mention tasty food. Give the food a try if you are in the area, you will not be disappointed as the variety of food here are worth making the trip down.